Sweden, Spring, a week of CRW, sounds like fun! 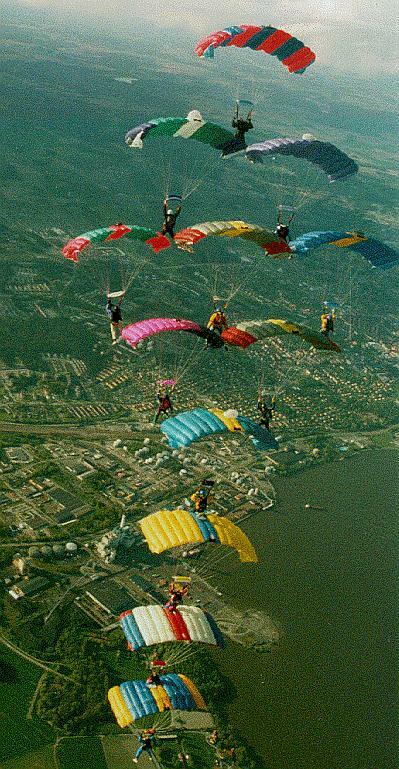 It was going to be an exciting adventure as I prepared for the Diamond Quest camp at The Parachuting club of Aros in Västerås, Sweden. I then received the 12 Flight Concepts International Prodigy canopies that I was bring with me. I never realized how much parachutes can weigh and I did not relish lugging more than 150 pounds of parachutes on this trip. After many headaches and experiments, I did manage to get everything packed up and I headed off to Sweden. It was sunny and warm when I arrived in Sweden on Saturday, May 16th. Magnus Karlsson, one of the CRW novices, met me and the 150 pounds of canopies at the airport in Stockholm. 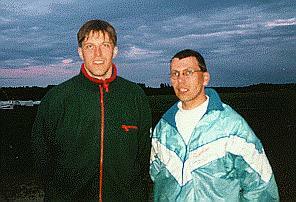 We got to Johannisberg's airfield, Västerås, where The Parachuting club of Aros is located, after an hours drive. That afternoon and evening we were joined by Lennart Vestbom, the organizer of the event and DQ instructors Pasi Pirttikoski and Topi Astikainen from Finland. The Parachuting club of Aros have a Single Otter as their primary jump ship. The club offers indoor packing, classrooms for video debrief, lodging, kitchen facilities, indoor showers and a sauna. The primary runway is paved and there is an alternate grass strip. There is plenty of space to land on the DZ and with the exception of a nearby lake, there is plenty of room for off-DZ landings too. We made sure jump run for the CRW loads were away from the lake. The friendly people and beautiful surroundings made this DZ a very enjoyable place to jump. We were blessed with blue skies and warm weather Sunday and the camp participants began arriving. Pasi and I organized the novices while Topi took charge of the experienced Canopy Formation Aviators who had vertical formation experience, but had done little, if any, off-set formations. The novices sat through the mandatory lecture on CRW basics and the jumping began with 2-way orientation dives for each novice. We then proceeded to make 4-way rotation dives to give each novice a chance to dock on a vertical formation. By second day, the novices had their 4-stack awards and by mid-week, they were flying in 4-way diamonds and 6-way boxes. The novices learned fast and on the first jump on Wednesday, with -20 degree Celsius temperatures at altitude and sleet battering us when we left the plane, the novices, with Pasi and myself, completed a 2 point 7-way (6-way box with row 4 wing). Row 4 wings were docked for the first time in the skies over Sweden. While Pasi and I were playing with the novices, Topi was organizing the experience jumpers doing 5 to 6-way off-set formations. More experienced jumpers arrived Sunday night and with Topi as pilot, they started to build 9 and 10-ways Monday. Although most of the jumpers in Topis group had little or no off-set experience, they manage to complete a 10-way kite on the last jump on Monday. Topi continued to lead the experienced jumpers throughout the week. By Friday, they were ready to attempt to break the Nordic record which was a 10-way kite set by the Finns in early May. With Pasi and Mauri , who were helping with the novices, joining Topis group, they set a new Nordic CRW record by completing a 12-way kite and holding it for 20 seconds. I think all the participants and the organizers will agree that this was a very successful camp. There is a lot of talent and enthusiasm for CRW in this group of Canopy Formation Aviators. I know they will continue to improve their skills and help make CRW more popular in Scandinavia. DQ has now been in Sweden for the first time. During one week in the middle of May, 18 people from Sweden and Finland gathered in Västerås, Sweden to participate in the first DQ camp in Sweden. 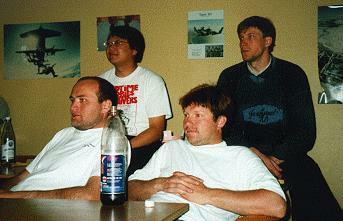 DQ's representative was Ted Cheung, other instructors were Pasi Pirtikoski and Topi Astikainen, both from Finland. 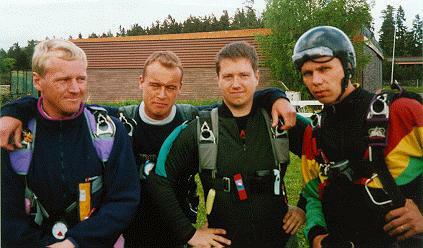 The CReW traditions in Sweden are not so old, they started in 1996 after being almost dead since the eighties. Since we're still in the CReW-cradle we're doing most rotations so we have no experience in offset formations. So DQ was invited by CReW-club (That is an association that promotes the development of CReW in Sweden) to Sweden to widen our knowledge. The camp was announced to welcome both experienced jumpers and beginners, and 6 jumpers that had none/almost none experience at all of CReW showed up. The jumping started almost right away on the Sunday for the experienced jumpers and the novices had security and theory lessons prior to the first jumps. Most of the people did their first diamonds during the week and many cases of beer were drunk. Amazing were how fast the novices learned with such good instructors. They managed to do a 5 or 6-way Box in their fifth jump. The experienced jumpers were jumping mostly in groups of 5-10. We were jumping PD Lightnings and Flight Concepts International's Prodigy's in different groups. We made some real nice Diamonds and by the end of week we had managed a nice 9-way diamond and two 10-ways. 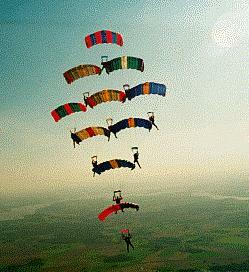 We were going for a new Nordic Record in offset formations. The Finns had just made a 10-way in the beginning of May that we had to break that record. The incredible thing about the Finnish record, is that all the participants were from the same club (that makes about 3-4000 jumps per year). In the end of the week a 12-way formation was formed. It was a 9-way Diamond with 3 stingers and it flew for 20 seconds, before it lost its tail. The weather was really good, measured with our standards, in the beginning of the week. But the good weather didn't last, and the polar air brought rain and freezing weather. We had to take the opportunities we got in the end of the week to get up in the air. 364 total jumps were made during the week and we had about 10 funnels/wraps and no cut-aways at all. Photographs by Lennart Vestbom, Anders Sandvik and Rolf Larrson.